Anjali Arondekar’s work has drawn attention in academic circles for some time now and Goa got a chance to listen to her during the December 2011 conference at the Goa University. With well-argued perspectives and deep scholarship, this Associate Professor of Feminist Studies and Literature at the University of California, Santa Cruz, makes her point without mincing words on contentious issues relating to Goa. Dr Arondekar’s research engages poetics and politics of sexuality, colonialism and historiography, with a focus on South Asia. 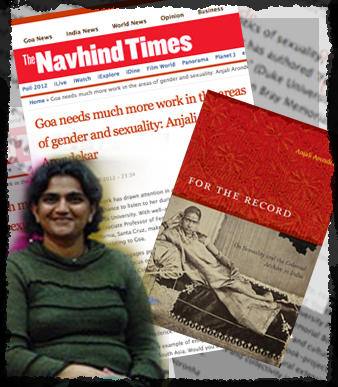 She has authored ‘For the Record: On Sexuality and the Colonial Archive in India’ (Duke University Press, 2009; Orient Blackswan, 2010), and is winner of the Alan Bray Memorial Book Award for best book in lesbian, gay, or queer studies in literature and cultural studies, Modern Language Association (MLA), 2010. Her second book-project, ‘Margins of Desire: Sexuality, Historiography, South Asia’, is a natural extension of her interest in the "figurations of sexuality, ethics and collectivity in colonial British and Portuguese India", to use her words.